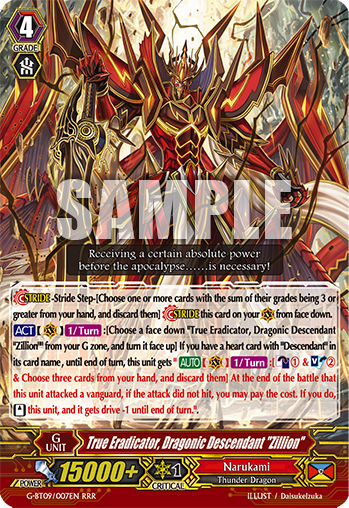 The evolved form of “Eradicator, Dragonic Descendant” is previewed in English. [ACT](VC)[1/Turn]:[Choose a face down card named “True Eradicator, Dragonic Descendant “Zillion”” from your G zone, and turn it face up] If you have a heart card with “Descendant” in its card name, until end of turn, this unit gets “[AUTO](VC)[1/Turn]:[Counter Blast (1) & Soul Blast (2) & Choose three cards from your hand, and discard them] At the end of the battle that this unit attacked a vanguard, if the attack did not hit, you may pay the cost. If you do, [Stand] this unit, and it gets drive -1 until end of turn.”.